A two tone orange bag with the traditional styling doesn't really scream, HOT, HOT, HOT. It just says it quietly. The image of the Chips is certainly one of the worst we have seen. We don't like complete negativity though, so the logo looks good at the top of the bag. The Chips are cut thinly. The crunch was tempered a little by the oil and seasoning powder. Not the crispiest crunch, but adequate for a Chip of this nature. A kind of nuclear orange sort of color, if there is such a thing. The Chips were of a standard size, shape and thickness, but the seasoning was really bright. This stayed on fingers after a handful. As Herr's have so many flavors including niche varieties such as Old Bay Seasoning. Plus a number of other Hot Sauce and barbecue related flavors, like Texas Pete Hot Sauce. We were expecting the hottest Chip on the market. They had a peppery, sweet paprika aroma and this was followed by a very Hot Sauce Chip. 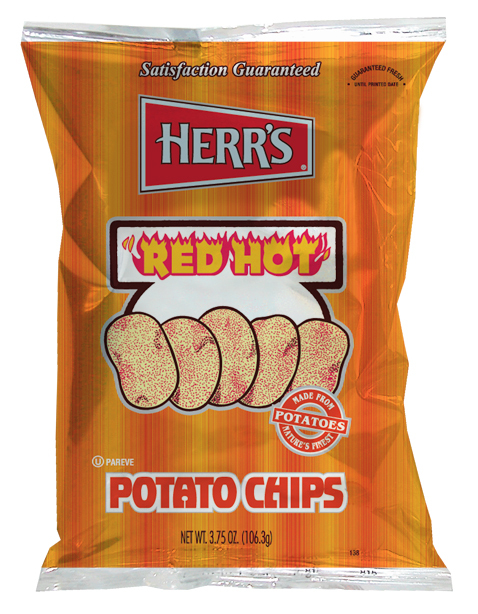 It was nice and consistent, but really, come on Herr's - we wanted the Hottest Chip ever!